the Cadillac Northstar LMP Le Mans prototype did not actually use an engine from a Cadillac, but instead an Oldsmobile? William E. Metzger opened one of the United States' first automobile dealerships and co-organized Cadillac Motor Car Co? For other uses, see Cadillac (disambiguation). Cadillac (pronounced /ˈkædɨlæk/ or, "à la française": pronounced: [kadiˈjak]) is a luxury vehicle marque owned by General Motors Company. Cadillac vehicles are sold in over 50 countries and territories, but mainly in North America. Cadillac is currently the oldest American automobile manufacturer and among the oldest automobile brands in the world. Founded in 1902 as the Cadillac Automobile Company, it was purchased in 1909 by General Motors and over the next 30 years established itself as America's premier luxury car. Cadillac pioneered many accessories in automobiles, including full electrical systems, the clashless manual transmission and the steel roof. The brand developed three engines, one of which (the V8) set the standard for the American automotive industry. From its earliest years Cadillac aimed for precision engineering and stylish luxury finish, causing its cars to be ranked amongst the world's finest. Utilization of interchangeable parts was an important innovation in 1908. Cadillac was the first volume manufacturer of a fully-enclosed cab in 1910, and in 1912, was first to incorporate an electrical system enabling starting, ignition and lighting. In 1915 it introduced a 90-degree flathead V8 engine with 70 horsepower at 2400 rpm and 180-pound feet of torque, allowing its cars to attain 65 miles per hour. This was faster than most roads could accommodate at this time. Cadillac pioneered the dual-plane V8 crankshaft in 1918. In 1928 Cadillac introduced the first clashless Synchro-Mesh manual transmission, utilizing constant mesh gears. In 1930 Cadillac implemented the first V-16 engine, with a 45-degree overhead valve, 452 cubic inches, and 165 horsepower, one of the most powerful and quietest engines in the United States. The development and introduction of the V8, V16 and V-12 helped to make Cadillac the "Standard of the World." A later model of the V8 engine, known as the overhead valve, set the standard for the entire American automotive industry in 1949. Their first car was completed in October 1902, the 10 hp (7 kW) Cadillac. It was practically identical to the 1903 Ford Model A. Many sources say the first car rolled out of the factory on October 17; in the book Henry Leland — Master of Precision, the date is October 20; another reliable source shows car number 3 to have been built on October 16. In any case, the new Cadillac was shown at the New York Auto Show the following January, where it impressed the crowds enough to gather over 2,000 firm orders. The Cadillac's biggest selling point was precision manufacturing, and therefore, reliability; it was simply a better-made vehicle than its competitors. Cadillac participated in an interchangeability test in the United Kingdom 1908, when it was awarded the Dewar Trophy for the most important advancement of the year in the automobile industry. Cadillac was purchased by the General Motors (GM) conglomerate in 1909. Cadillac became General Motors' prestige division, devoted to the production of large luxury vehicles. The Cadillac line was also GM's default marque for "commercial chassis" institutional vehicles, such as limousines, ambulances, hearses and funeral home flower cars, the last three of which were custom-built by aftermarket manufacturers. Cadillac does not produce any such vehicles in their factory. In July 1917, the United States Army needed a dependable staff car and chose the Cadillac Type 55 Touring Model after exhaustive tests on the Mexican border. Two thousand three hundred fifty of the cars were supplied for use in France by officers of the American Expeditionary Force during World War I. Pre-World War II Cadillacs were well-built, powerful, mass-produced luxury cars aimed at an upper class market. In the 1930s, Cadillac added cars with V12 and V16 engines to their range, many of which were fitted with custom coach-built bodies; these engines were remarkable at the time for their ability to deliver a combination of high power, silky smoothness and quietness. In 1932, after Cadillac suffered from record low sales and charges of discrimination against black customers, Alfred Sloan created a committee to consider the discontinuation of the Cadillac line. At a fateful board meeting Cadillac president Nicholas Dreystadt heard that legendary boxer Joe Louis could not go into a dealership to buy a car because he was black, and resorted to having a white friend make the purchase for him. Dreystadt gave the GM board of directors a 10-minute speech in which he advocated advertising to black consumers so as to increase sales. The board agreed to give Dreystadt 18 months to produce results. Cadillac managed to survive the Great Depression by being part of GM. By 1940 Cadillac sales had risen tenfold compared to 1934. Cadillac's other distinctive styling attribute was its front-bumper designs which became known as Dagmar bumpers or simply Dagmars. What had started out after the war as an artillery shell shaped bumper guard became an increasingly important part of Cadillac's complicated front grille and bumper assembly. As the 1950s wore on, the element was placed higher in the front-end design, negating their purpose as bumper guards. They also became more pronounced and were likened to the bosom of 1950s television personality Dagmar. In 1957 the bumpers gained black rubber tips which only heightened the relationship between the styling element and a stylized, exaggerated bumper design. For 1958 the element was toned down and then was completely absent from the 1959 models. In 1966, Cadillac would mark up its best annual sales yet, over 192,000 units (142,190 of them de Villes), an increase of more than 60%. This was exceeded in 1968, when Cadillac topped 200,000 units for the first time. The launch of the front-wheel drive Eldorado in 1967 as a personal luxury coupe, with its simple, elegant design — a far cry from the tail-fin and chrome excesses of the 1950s — gave Cadillac a direct competitor for the Lincoln and Imperial, and in 1970, Cadillac sales topped Chrysler's for the first time. The new 472 cu in (7.7 l) engine that debuted in the 1968 model year, designed for an ultimate capacity potential of 600 cu in (9.8 l), was increased to 500 cu in (8.2 l) for the 1970 Eldorado. It was adopted across the model range beginning in 1975. The 1970s saw vehicles memorable for dimensions not seen since the 1960s, but not extremely so. The 1972 Fleetwood was some 1.7 in (43 mm) longer in wheelbase and 4 in (100 mm) overall, compared to the 1960 [[Series 75 Fleetwood, while the entry-level 1972 Calais was 2.4 in (61.0 mm) longer than the equivalent 1960 Series 62, on the same wheelbase. Growth in weight and standard equipment demanded increases in engine displacement before the downsizing era set in later in the decade. Performance waned after peaking at 420 hp (313 kW) (gross) and over 550 foot-pounds force (750 N·m) of torque in the first year and further declined in 1971 and later years due to reductions in compression ratios necessitated by the advent of low-octane unleaded fuel and increasingly stringent emission requirements. Despite record sales in 1973 and again in the late 1970s, Cadillac suffered from the malaise that set in to the American auto industry in the late 1970s to the late 1980s, partly driven by a failure to respond effectively to new government mandates on safety, emissions and fuel economy. The compact Seville was introduced in April 1975 as a 1976 model and came standard with Cadillac's first electronic fuel injection system. The engine was a fuel-injected version of the Oldsmobile 350. The 1977 downsized full-sized cars and the Eldorado were fitted with a downsized 425 cu in (7 L) V8. This engine provided good performance and fuel economy for the downsized RWD models but was underpowered for the large Eldorado. The bore was further reduced for 1980-1981 to provide 368 cu in (6 L), again sharing the stroke of the original 472, as well as the weight and physical bulk. As with most American brands, Cadillac was forced to downsize its offerings between the 1973 and 1979 fuel crises. Its staple De Ville and Fleetwood were downsized for 1977 and again for 1985 when the cars were also changed to a front-drive configuration. A downsized Eldorado debuted in 1979, with a new bustleback Seville sedan introduced on the same platform in 1980. Both the Eldorado and Seville were further downsized in 1986 into the compact-car class, with sales also shrinking. The "look-alike, drive-alike" syndrome that affected most General Motors divisions under the administration of Roger Smith would have a negative effect on Cadillac as it tried to downsize its models. The DeVille, a generally successful model for Cadillac, would receive a complete redesign in 1985 that made the car heavily resemble its platform mates, the Buick Electra and Oldsmobile 98. Due to gasoline shortages during 1970s oil embargoes and a desire for better fuel efficiency, Cadillac offered an Oldsmobile V8 engine that used diesel fuel, the 'LF9' 350 cu in (5.7 L) unit, in its full-size cars from 1979 to 1985. A V6 diesel was available for the 1985 model year, but was quickly discontinued. A hastily modified version of the long and well-serving Oldsmobile Rocket 350 V8 gasoline engine was used rather than designing a small diesel engine from scratch, as was common in the industry, to quickly respond to customer demand and to keep overall powerplant (and hence overall chassis) weight to a minimum. Two extra main bolts were installed and the main bearing journals were also increased to 3 inches (76 mm) to compensate for the higher stress that diesel engines exert on their reciprocating parts. This engine quickly gained a reputation for unreliability as a wave of catastrophic engine failures followed, usually a lower end component or head gasket, pointing to some combination of inadequate design, substandard metallurgy, and substandard machining. GM had recurring quality problems with the latter two deficiencies in a variety of internal parts across multiple engine and transmission lines throughout its mid-'70s-to-mid-'80s decade, so these problems certainly would not have been out of place in Olds 350 diesels. In addition, the fuel system did not have an effective water separating system, and neither the buyers nor the dealer service staff were adequately informed about the products and procedures necessary for the proper maintenance of the engine. This led to corrosion in the fuel injection pump, leading in turn to incorrect injection cycles, cylinder head lift, stretching or breaking of cylinder head bolts, head gasket failure, hydro-lock from coolant leaking into the cylinder, and the failure of internal engine components and attendant catastrophic engine failure. Ironically, Detroit Diesel, another division of GM, had decades of experience building high-quality but much larger diesel engines. In an attempt to appeal to younger buyers, Cadillac launched the compact Cimarron in 1982. The Cimarron shared the J platform with the Chevrolet Cavalier, Buick Skyhawk, Oldsmobile Firenza, Pontiac J2000, Holden Camira, Isuzu Aska and Opel Ascona, and was expected by GM leadership to rival the BMW 3-series in sales performance. Another nadir during the early 1980s was the variable displacement engine, branded the L62 V8-6-4 engine. Introduced in 1981 this 6 L (368 cu in) engine selectively activated and deactivated cylinders according to power demand. But it proved unreliable and was dropped from all models, except the Fleetwood limousine, the next year in favor of a family of smaller aluminum V8 engines rushed into production. The HT-4100 4.1 L (~250 cu in) engine was used widely in Cadillacs from 1982 through 1987. The majority of HT4100s failed before 60,000 miles (97,000 km) and many of the 1,000,000 HT4100s installed in 1982-1987 Cadillacs were replaced by the factory under warranty, although some motors went 200,000 miles (320,000 km) with extremely careful maintenance and no overheating episodes which this aluminum block engine does not tolerate. The HT4100s problems were far more serious and prevalent than those in the one-year-only V8-6-4 and cost Cadillac the loyalty of many customers. Cadillac introduced the 4.5-liter aluminum V8 in 1988 which proved to be a very reliable motor, these motors often see well over 250,000 miles (400,000 km). This power plant was bumped up to 4.9 liters in 1991 and ran until 1993. The famous Northstar V8 would power the Eldorado from the 1993 model year through the next decade. Cadillac tried to rebuild its image in 1987, aware that imported European and Japanese performance models were on a rise, and with Honda launching its American luxury division, Acura. Some new design approaches were tried: the Seville, for instance, was downsized to BMW 5 series proportions and had rounded wheel arches with only a hint of chrome. During this period, the greatest challenge to the import sports cars was the Cadillac Allanté, a convertible designed by Pininfarina of Italy, and built on what was touted as the world's longest production line—with the car's bodies fabricated in Italy and flown by Boeing 747 to the United States to meet their transmission and engine. In the initial two years of production, Cadillac offered no options for the Allanté except for the interior and body color. Like the Cimarron of a few years earlier, the Allanté was introduced with an engine which was below the expectations of its target market. The 170 horsepower (130 kW) HT-4100 engine was insufficient against more powerful competition. This introductory platform turned off many potential customers, who considered the vehicle to be underpowered for its $55,000 price tag, causing them to conclude that Cadillac was not genuinely committed to building a performance car. In 1989 the powertrain was improved with the 4.5 L engine producing 200 horsepower (150 kW). Finally, in 1993 the powertrain was again upgraded to respectable performance with the 4.6 L Northstar V8 producing 290 horsepower (220 kW). This turned out to be the final year of production, as Allanté sales never reached the volume which Cadillac hoped for. The Cimarron and Seville models marked a beginning of "smaller" cars for the Cadillac line. Throughout the 1980s, American auto makers downsized most of their models and Cadillac was no exception. For the 1985 model year, the DeVille was dramatically downsized and utilized front wheel drive. The Eldorado and Seville were both redesigned and downsized for 1986. By the late '80s, the Fleetwood Brougham was the only Cadillac model that retained the style and size of the "big" DeVilles and Fleetwoods of the '70s. The "Fleetwood" name was removed from the Brougham in 1987 and the front-wheel drive "Fleetwood" models were technically DeVilles with a special interior and trim option. The Brougham was redesigned in 1993 and renamed the Fleetwood, with an optional Brougham package, towing capacity is up to 7,000 pounds (3,200 kg) with the L05 V8. In 1994 Cadillac replaced the L05 engine with the new more powerful LT1 engine. The Fleetwood was discontinued after the 1996 model year. Following the demise of the Fleetwood, the Lincoln Town Car was left as the sole traditional full-sized luxury car remaining in the U.S. market. In the first week of May 1999, a public retraction and apology was issued by GM spokesman Jim Farmer, admitting that "a combination of internal control breakdowns and overzealousness on the part of our team members" was the cause of the overstated figures, and adding that those responsible had been disciplined. However neither brand would have any reason to celebrate any sales success in the U.S. luxury market as their prior number one and number two positions had been overtaken by Japanese and German brands. Cadillac has resisted the trend towards producing "retro" models such as the revived Ford Thunderbird or the VW New Beetle. It has instead pressed ahead with a new design philosophy for the 21st century called "art and science" which it says "incorporates sharp, sheer forms and crisp edges — a form vocabulary that expresses bold, high-technology design and invokes the technology used to design it." This new design language spread from the original CTS across the line all the way up to the XLR roadster. Cadillac's model line-up mostly includes rear- and all-wheel-drive sedans, roadsters, crossovers and SUVs. The only exceptions are the front-wheel drive Cadillac BLS (which is not sold in North America) and the Cadillac DTS. Many of these actively compete with respected high-end luxury cars produced by German and Japanese manufacturers. The flagship of these efforts is the second-generation CTS-V, which is a direct competitor to the vaunted BMW M5. An automatic version of the CTS-V lapped the Nürburgring in 7:59.32, at the time a record for production sedans. ^ "Cadillac Centennial Anniversary (brochure)". http://www.motorcities.org/pdf/yrt_tours_cent_cadillac.pdf. ^ a b c d e f g h i j k Laam, Michael (January 2002). "100 Years of Cadillac History". Popular Mechanics. http://www.popularmechanics.com/automotive/reader_rides/1267556.html. ^ Flory, J. "Kelly", Jr. American Cars 1946-1959 (Jefferson, NC: McFarland & Coy, 2008), p.190. ^ a b Flory, p.255. ^ Flory, J. "Kelly", Jr. American Cars 1960-1972 (Jefferson, NC: McFarland & Coy, 2004), pp.423 & 425-8. ^ Flory, p.570. Karl Ludvigsen's "Cadillac: The Great American Dream Come True", in Northey, Tom, ed. World of Automobiles (London: Orbis, 1974), Vol. 3, p.297, mistakenly dates this to 1967. ^ Flory, pp.20, 23, 878, & 880. ^ John O'Dell (1999-05-06). "Cadillac Apologizes to Lincoln for Inflating Sales Numbers". Los Angeles Times. http://articles.latimes.com/1999/may/06/business/fi-34467. Retrieved 2009-01-21. ^ Squatriglia, Chuck (2009-01-11). "GM Promises a 40-mpg City Car And a Cadillac Volt". Wired. http://www.wired.com/autopia/2009/01/gm-promises-a-4/. Retrieved 2009-05-08. Bonsall, Thomas E. (2004). The Cadillac story: the postwar years. Stanford University Press. ISBN 9780804749428. Cadillac  is a city in the state of Michigan. The community has a population of approximately 10,000 within city limits, and over 40,000 within the surrounding two counties. Established as an industrial town, Cadillac was originally known as the Village of Clam Lake. The Village was incorporated into a city in 1877, changing its name to Cadillac. The area became a popular tourist destination following World War II, and remains so today. Cadillac is the gateway to northwest Michigan. Nearly a million visitors come each year to the area, to enjoy the scenic lakes and quaint small town. While popular, Cadillac is quiet and makes a great Northern Michigan destination for summer and winter recreation enthusiasts. Lake Cadillac lies entirely within the boundaries of the City. This feature has led to a geographically unique community, with most city commerce taking place on the east shore of the lake—the downtown—while many businesses catering to tourists are located on the west shore. Locals refer to this western portion as Cadillac West. Knowing this terminology can be helpful if you plan to stay in the area. The residents of Cadillac and the surrounding area, like most Midwesterners, are open and friendly. If you need directions, locals will be happy to assist. Visitors are also welcome to ask for advice on where to get a tasty lunch or, if needed, a quick repair for their bicycle. Driving is the only practical means by which to visit Cadillac. The primary route, US-131, comes in from Grand Rapids. The state route MI-115 is used by visitors from the Detroit area. MI-55 comes in from Manistee and Lake Michigan, passing through Cadillac on its way to Lake Huron. Be sure to enjoy the scenery of Northern Michigan on your way to Cadillac. Indian Trails  offers bus service to Cadillac from various Michigan cities. Wexford County Airport , accessible to private aircraft, lies approximately two miles north of the downtown area. Personal automobile is the most convenient means of getting around, with free parking available around the city. Parking downtown is convenient and plentiful, even during major events. Biking is highly recommended for those staying on or near the lakes. 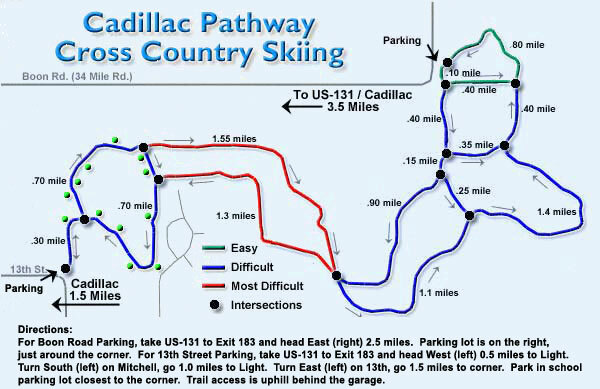 Cadillac has a bike path along the shores of Lake Cadillac, so each-west travel between the downtown and the Cadillac West is convenient. Biking on the local streets is safe, and there are a number of nature trails in the area that provide great off-roading. Rental facilities are available . Walking around the downtown area is easy and safe. The Cadillac/Wexford Transit Authority  runs a demand response bus service. In the summer the Authority runs a mid-day fixed-route service. The line runs between Cadillac West and the downtown. Cadillac surrounds Lake Cadillac and part of Lake Mitchell. The downtown is adjacent to the latter, and public docks make it easy to tie up a boat and walk to shops and food. Many of the restaurants around the lake provide docks. Launching your own boat or renting is highly recommended. A number of local businesses rent out watercraft . If you rent a campsite at Mitchell State Park, you are allowed dock up your boat alongside of the canal. The downtown, which includes a number of quaint shops, a movie theatre  and a park, is picturesque. It is popular with tourists year-round. Courthouse Hill Historic District, . Adjacent to the downtown, part of the original Village of Clam Lake. Many of the homes in the District are large, Victorian-style residences built by the lumber barons and businessmen who helped establish Cadillac more than a century ago. Clam Lake Canal, . Constructed originally to transport logs from Lake Mitchell to the mills on the shores of Lake Cadillac. It is now used exclusively by recreation lakecraft. With the canal, the two lakes comprise approximately 3700 acres of open water. The Cadillac area is very popular with tourists who favor active recreation activities. The city surrounds Lake Cadillac and is adjacent to Lake Mitchell. There are a number of public boat ramps; there is a launch on the northwest side of Lake Cadillac, in Kenwood Park, while on the northeast end of Lake Cadillac, next to City Park and the downtown, there is another ramp. Adventure Island, 6083 E MI-115, 231-775-2527, . Waterslides, mini-golf, batting cages and go-carts. Arcade activities indoors. Johnny’s Fish and Game Park, 5465 E 46 1/2 Rd., 231-775-3700, . Open Memorial Day through Labor Day. Pond fish for rainbow trout, feed deer and other animals. Great for small children. Sound Garden, . Truly unique hands-on sculpture on the shores of Lake Cadillac. Native materials, primarily silver maple, beach, and ironwood were used to make this set of sculptural instruments. Mitchell State Park, 6093 E MI-115, 231-775-7911, . Located between the two lakes. It is home to the Carl T. Johnson Hunting and Fishing Center , which documents the history of hunting and fishing in Michigan. The Center is open year-round. There is also a 2.5-mile (4.0 km) nature trail that leaves from the Hunting and Fishing Center. Manistee National Forest, . Lies immediately to the west of Cadillac. The national forest is popular with ORVers . Eldorado, 7839 E 46 1/2 Rd, 231-779-9977 . 18 hole public golf course. The Cadillac Grill Restaurant is on site. McGuire's Resort, 7880 Mackinaw Trail, 800-634-7302, . 27 hole public golf course. Views of Lake Cadillac. Cadillac Country Club, 5428 E MI-55, 231-775-9442 (Winter 231-775-8758), . Established in 1910, the Cadillac Country Club course is a 6017 yard, par 70 classic. UpBeat Cadillac, . This jazz-in-the-park series is offered nearly every Thursday in the summer. Downtown Cadillac, City Park, Rotary Pavilion. First Night Cadillac, . Annual New Years Even celebration held at various locations throughout the city. Music, games, face painting, dog sleds, petting zoo, displays of local artists' works. North American Snow Festival, . Held every winter, over frozen Lake Cadillac. Events include snowmobile racing, sleigh rides and an ice fishing tournament. Hermann's European Café, 214 N Mitchell St, (231) 775-9563, . Selections change daily. Offers seafood and fine international cuisine. G & D Party Store, 223 S Mitchell St, (231) 775-1229. Carry out and delivery. Locally famous for its pizza. Lakeside Charlie’s, 301 S Lake Mitchell Dr, (231) 775-5332. American cuisine. Located in Cadillac West, on the shores of Lake Mitchell. Marina Ristorante, 2404 Sunnyside Dr (MI-115), (231) 775-9322. Italian cuisine. Located on the southwest shores of Lake Cadillac, in Cadillac West. Docks available for boaters. Shay Station Coffee Co, 106 S Mitchell St, 231-775-6150, . Popular downtown eatery. Live music every Friday night. McGuires Resort, 7880 Mackinaw Trail, 800-632-7302, . Standard rooms with double or king beds, studio rooms with fireplaces and deluxe suites are available. Tennis courts, pool and sauna, 27 holes of golf. Holiday Inn Express, 7642 S US-131, 231-779-4656, . 70 guest rooms and suites, indoor pool, whirlpool and fitness room. Caberfae Peaks Resort, Caberfae Rd, 231-862-3000, . 36 guest rooms in MacKenzie Lodge, with year-round heated pool and hot tub. Ski slopes with 34 Runs, rental shop, day lodge with cafeteria and bar; 9 holes of golf. Mitchell State Park, 6093 E MI-115, . This state park lies between Lakes Cadillac and Mitchell and in fact straddles the canal connecting the two lakes. There 221 campsites, with modern toilet buildings, showers and sanitation stations. Eight campsites are wheelchair-accessible. A mini-cabin is also available for rent. Reservations are strongly recommended, especially for the sites along the canal. Camp Cadillac, 10621 E 34 Rd, 231-775-9724, . Private campground, located 3 miles (5 km) to northeast of the city. It has a number of amenities including a petting zoo, a pool and internet access. Traverse City is 1 hour north on MI-115 and MI-37. Sleeping Bear Dunes National Lakeshore is 1.5 hours northwest on MI-115. Manistee is 1 hour west on MI-55. Grand Rapids is 2 hours south on US-131. CADILLAC, a city and the county seat of Wexford county, Michigan, U.S.A., on Lake Cadillac, about 95 m. N. by E. of Grand Rapids and about 85 m. N.W. of Bay City. Pop. (1890) 44 6 4; (1900) 5997, of whom 1676 were foreign-born; (1904, 446 state census) 6893. It is served by the Ann Arbor and the Grand Rapids & Indiana railways. Cadillac overlooks picturesque lake scenery, and the good fishing for pike, pickerel and perch in the lake, and for brook trout in streams near by, attracts many visitors. Among the city's chief manufactures are hardwood lumber, iron, tables, crates and woodenware, veneer, flooring and flour. Cadillac was settled in 1871, was incorporated as a village under the name of Clam Lake in 1875, was chartered as a city under its present name (from Antoine de la Mothe Cadillac) in 1877, and was rechartered in 1895. Red Wiggler, the Cadillac of worms. Cadillac is an automobile maker, owned by General Motors. They are known for making luxury cars. In the United States during the 20th century, Cadillacs were so highly thought of that the phrase "the Cadillac of x" was coined, meaning that something is of excellent quality and better than everything else in its category. Cadillac Owners Yahoo group - CadillacOwners : The first mailing-list dedicated exclusively to Cadillac owners.